The PCA Club Racing Porsche Cayman GT4 Clubsport Trophy East series wrapped up its second successful year over the weekend at the iconic Daytona International Speedway in Porsche Club of America (PCA)’s Oktoberfast 2017 event hosted by PCA Zone 12. Seventeen drivers kicked off the weekend during Sprint 1 Saturday afternoon with newcomer and polesitter Mortiz Kranz placing first overall and first in the Pro class with the fastest lap time of one minute, 57.531 seconds in his No. 21 Cayman GT4 Clubsport MR entry. Series veteran David Baum, representing the Western Michigan PCA Region in his No. 24 Autometrics Motorsports entry, passed Championship class competitor Alejandro Galindo to gain first place. Baum also recently nabbed a victory at NOLA Motorsports Park in September during the 80-minute enduro race. NOLAsport’s Galindo, representing the Mardi Gras PCA Region, placed second with his teammate John Crosby, also of the Mardi Gras PCA Region, coming in third in the Championship class. In the Masters class, which is for drivers ages 57 and older, Crosby won first place with Autometrics Motorsports’ Charlie Craig coming in second in his No. 76 entry and TOPP Racing’s Richard McIntosh behind him in third place. Kranz led the race flag-to-flag with Bruce McKee, who represents the Alabama PCA Region, coming in second place in the Pro class and Autometrics’ Noël Brown placing third in his No. 33 Clubsport entry. During Saturday afternoon’s Sprint 2, Muehlner Motorsports America’s Kranz once again led pole-to-pole to win his second race of the day in the No. 21 Clubsport MR entry. The Championship class repeated its 1-2-3 finish with Baum, Galindo and Crosby. Baum’s fastest lap time during Sprint 2 was 1:58.809. None of the drivers have more on the line this weekend than Baum and Galindo. The two are battling for second and third place overall in the Championship banquet with Baum leading by just nine points. Galindo was ahead of Baum for the first half of the 30-minute sprint, but Baum managed to pass Galindo on the front straight and stay ahead – beating him to the finish line by 8.415 seconds. In the series’ Pro class, Adam Merzon, representing the Connecticut Valley PCA Region with Speedsport Tuning, got his first podium of the weekend, placing second above BGB Motorsports’ Bruce McKee. Crosby once again dominated the Masters class with McIntosh placing second and Craig placing third. McIntosh passed Craig in the final few laps of the race to get his best finish of the day. 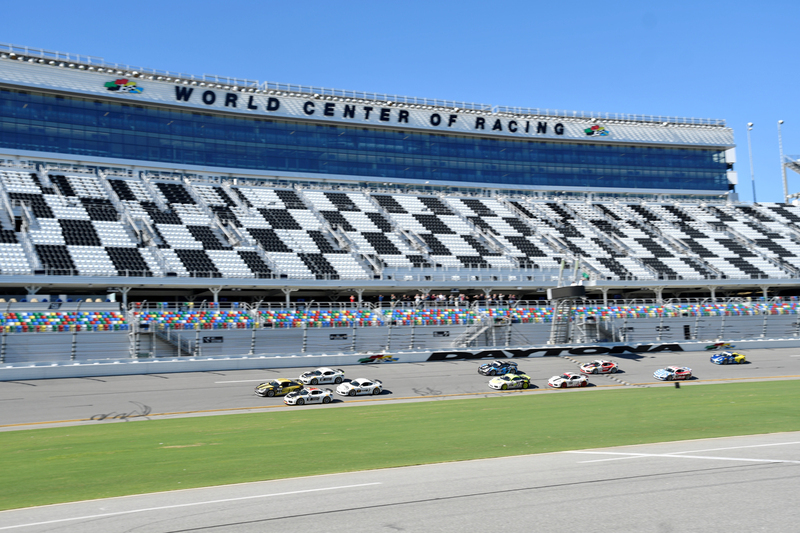 The PCA Club Racing Porsche Cayman GT4 Clubsport Trophy East series wrapped up its 2017 season with an exciting enduro race Sunday at Daytona International Speedway with series veteran Baum sweeping the weekend. Drivers enjoyed breezy, sunny weather during the 80-minute race, and families and friends cheered the competitors on during the last podium of the year. The second-place Championship class position was tight between Galindo and Baum, but after Baum won three victories this weekend, he clinched the second-place spot behind Tennessee PCA Region member Curt Swearingin. NOLAsport’s Crosby came in second place in the Championship class with ACI Motorsports’ David Hurt coming in third after working his way up from the back of the back. This marked his first podium of the weekend. In the Pro class, Kranz once again dominated winning first place, plus first overall. Father and daughter BGB Motorsports duo Bruce and Sydney McKee came in second place – this race marked Sydney’s first official event in their No. 87 MR entry and she finished out the stint for her dad. Brown rounded out the Pro class podium in third after a hard-fought battle between Masters class contender McIntosh. Crosby dominated the Masters class this weekend after sweeping both sprints and Sunday’s enduro. Louisiana PCA Region member McIntosh came in second in the Masters class – his third podium of the weekend. The 2017 season ended on a high note following the Championship Celebration at Daytona’s Goodyear 500 Club Sunday evening.